Does Rhubarb Need to be Peeled? 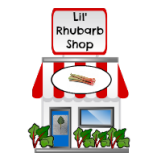 Many people contact me and ask, "Do you peel rhubarb"?, and "Does rhubarb need to be peeled?" The answer to this question is a resounding "NO"! Rhubarb never needs to be peeled, and should not be. I have grown rhubarb for many, many years, and harvested great quantities of rhubarb, but have never peeled the rhubarb stalks. 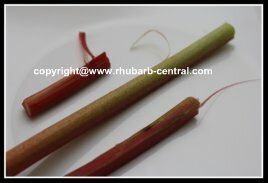 Some sources claim that the stalks of field-grown rhubarb may be too fibrous, causing "strings" to separate from the stalks, and therefore the strings need to peeled off. 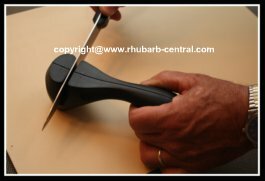 This is not necessary however, one just needs to be sure to use a sharp knife when processing /chopping the rhubarb. Rhubarb does NOT need to be peeled ... all you need to do is be sure to use a sharp knife when chopping rhubarb stalks. When chopping your rhubarb to use for a recipe, or to freeze rhubarb, ensure you have a sharp knife! 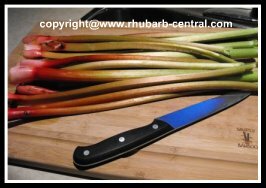 A sharp knife will eliminate any "strings" from coming apart from the rhubarb stalks. I just pulled the strings off, and that worked fine. My son-in-law, Joel, suggested I invest in a knife sharpener. He advised me that my cutting experience with rhubarb stalks, and with ALL other cutting of fruits, vegetables, meats, and so on, would improve drastically. I did invest in a simple, inexpensive, knife sharpener, exactly like the one pictured above). A "J. A. Henckels International Hand Sharpener". 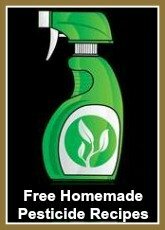 Click on the image above for additional product information and customer reviews at *Amazon.com). I cannot believe the difference this knife sharpener has made with all the cutting and chopping of food I do in my kitchen! Now I cannot imagine not sharpening my, (non-serrated), knives from time to time! If you do not own a knife sharpener, I whole-heartedly recommend you purchase one, (or add one to your Christmas wish list(!) 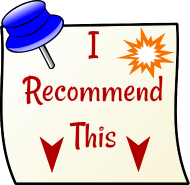 ... You will be glad you did! If you are looking for a gift for an Wedding Shower, a Birthday, or a Christmas gift, consider an indispensable knife sharpener. My rhubarb never gets stringy anymore! No one needs to peel rhubarb!